This weekend's #flashreadathon really gave me the boost I needed to get through some books! I finished one novel, knocked off half of another, and zipped through several comics. 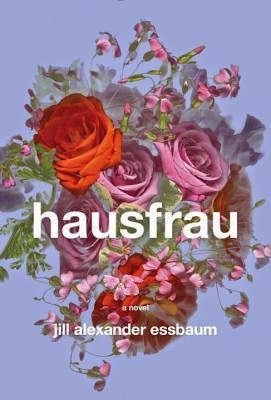 I finished up the much-talked-about Hausfrau, by Jill Alexander Essbaum. I have a review scheduled for tomorrow, so if you're keen to read this one, check out that spoiler-free review coming up. 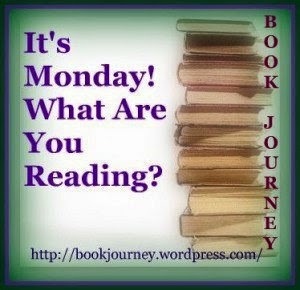 As you saw in yesterday's post, I did a little taste testing of various novels and ultimately decided to continue the readathon with Rainbow Rowell's Landline. This one is hitting just the right note for me right now, and with Greyson at his dad's until Tuesday evening, I hope I can polish this one off tonight. I picked up the first three issues of He-Man: The Eternity War, because nostalgia. Alas, nostalgia isn't working out so well for me. 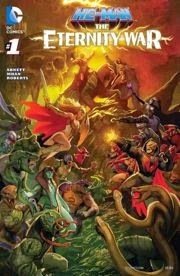 I'm a little underwhelmed by this series in general and there should be more She-Ra. We'll see if I decide to continue. 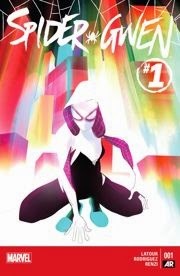 Spider-Gwen #1 is one issue I picked up on a lark. It flashed by me on Comixology, and I was intrigued by the cover. I'm not at all acquainted with the "Spiderverse," so I feel like I'm having a little trouble figuring out what the hell is going on. I'll give this one another issue or two to hook me if it can. 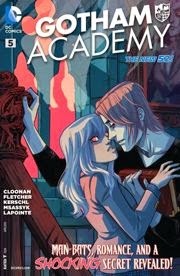 Gotham Academy #5 was fun. This series continues to intrigue me enough to keep reading. I feel like the forward momentum is a little slow, but I'm enjoying uncovering it bit by bit. As long as I'm liking it, I'll stay subscribed. The artwork in this one is simply gorgeous....another reason I look forward to it. #Flashreadathon was super duper fun. I loved following the hashtag on Twitter all weekend and interacting with old friends as well as finding some new-to-me bloggers. The #flashreadathon was brilliant. Sometimes it's just nice to know that you're not reading alone. I'm planning to read Hausfrau for review soon (I have a few more books to go first), but I've heard awesome things about it and will look for your review tomorrow. #flashreadathon rocked! I didn't read the oodles I'd hoped I would, but I finished a book, made a dent in others and had so much fun playing around on Twitter. Thanks for hosting such a laid back event! This week, I'm going to try to finish up the Southern Reach trilogy (Acceptance is going better than Authority so far) and A Partial History of Lost Causes. I'm looking forward to your Hausfrau review. I AM keen to hear your Hausfrau thoughts since you sounded like you weren't over the moon about it! I'm reading "Near Enemy" which is a follow up to a great book called "Shovel Ready". I am mighty excited for it! Hausfrau and Landline are on my TBR. I loved He-Man and She-Ra!! I had all the little she-ra figures when I was little. There was one with a blue outfit and red hair that was my favorite. Too bad nostalgia didn't work for you in reading form. I'm looking forward to your review on Hausfrau! Can't wait for your review of Hausfrau. I'll be reading it sometime this spring. There should always be more She-Ra. I really enjoyed the #flashreadathon, though I didn't get to pop on Twitter as much as I would have liked! It was just nice knowing we were all reading together, however far-flung we may be. :) I think Landline is the only Rowell book I don't own, though I haven't read them all yet . . . hmm. If it's anything like her others, I'm sure I'll love it! #flashreadathon was fun and I'm glad I was able to dip in to Twitter a little bit during a long work weekend. Hell, it was a major win that I heard about it before it started--sometimes I feel like I learn about the cool stuff after the fact. I suppose after six years on Twitter I'm finally getting the hang of it. Looking forward to hearing what you have to say about Hausfrau. I am definitely looking forward to the next #flashreadathon and wish I'd had more chance to participate over the weekend. Right now, I'm reading MACHINATIONS, edited by Chris Andrews, but I'm really not feeling it. I just haven't figured out what to pick up instead! I'm curious about Hausfrau! Seems to making its rounds in the blogosphere. 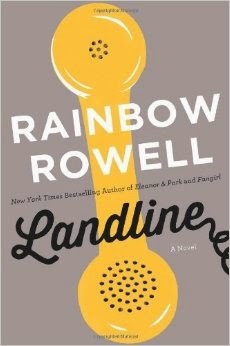 Landline was my least favorite of Rainbow Rowell's, but I still have Fangirl to read, so it may get nudged up a little bit. I loved Eleanor & Park, but Attachments is my favorite, probably because it's geared to a little older audience and reminded me a bit of where my husband works. I just finished listening to The Bear by Claire Cameron. Excellent, but I'm not sure if you want to read it. Pretty intense story about two little kids. Now I'm listening to Heads in Beds, which is good so far. I've heard some very different opinions on Landline, so I'm curious to hear what you'll think! Loved the #flashreadathon. On my radar: I finished Pet Sematary last night which is probably why I was up WAY too early this morning ;) Now, I'm finally going to dive into Station Eleven, hooray! My partner picked up issue 1 of Spider Gwen along with a dozen other newish titles but I haven't read it yet. I suspect I'll feel like you as I'm not familiar with the Spiderverse either. I'm making my way through Gardens of the Sun by Paul McAuley, which is really good but I'm not giving it enough time so it's slow going.